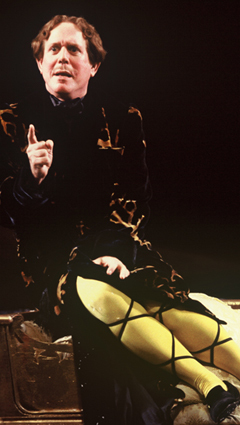 Photo of Floyd King in Twelfth Night (1998) by Carol Rosegg. Literary Associate Drew Lichtenberg interviews The Heir Apparent’s Floyd King and Nancy Robinette, two of STC’s Affiliated Artists, about 25 years of making people laugh. Drew Lichtenberg: How did you fall into classical comedy? Floyd King: I was part of the loose company of actors here in Washington before Michael came down. And I was thrilled with that – that was sort of my goal as a young person, to just get in a company and learn. I could have toured around the circuit of regional theaters, or I could be in one place and be forced to grow. Because audiences, whether they like you or not, they don’t want to see the same thing, over and over. FK: I’ve always said that I came here a performer, and Michael made me an actor. Shakespeare uses whole other muscles, and you have to learn how to use them. It’s been painful sometimes. I remember when I played Malvolio in Twelfth Night, instead of Feste. Michael wanted me in it, and he knew I could play it, but I didn’t know I could… It’s like going to the gym, when you’re building muscles. It can be painful. FK: Hard? [Long pause while thinking.] Thomas of Woodstock. Michael had taken Thomas of Woodstock and added it to Richard II. So when the play starts you know what all these references to Thomas of Woodstock mean. You’ve seen him die. It’s horrific. Any time I get outside of my comfort zone, I have to find a way to discover it. And it’s less about your ability than about what you believe your ability to be. You have to find a part of you in the character and you can use that to build another person. Does that make sense? DL: It’s the essence of acting, isn’t it? When you’re not sure where you end and the character begins. DL: The what will descend? FK: The dove. That which is out of the actor’s control. You do everything right, you work like a dog, and it still doesn’t gel. What happened? It’s not just you, that’s what you realize: the other actors, your state of mind. It’s such an ephemeral thing. DL: It sounds like, to do comedy, or roles that are a stretch, you have to do something that is very undefined. FK: Comedy, to me, is point of view. You have to have the ability to look at life sideways. From over here [gesturing] and not straight on, direct. Comedy is Hope. Some people have a tragic thing in their life, and they think, “What doesn’t kill me makes me stronger.” But it’s really what doesn’t kill you makes you funnier! Because if you look back on it, you can see humor. Even if it’s just your reaction to it. “Boy, was I suffering.” That is a sense of humor. It’s tied to intelligence and hope. DL: An ability to estrange yourself. FK: Right. To look at that person that you were. I remember, for example, laughing at my father’s funeral. I was very upset that he died. But I also noticed how everyone was acting at the funeral. They were doing their own personal “funeral thing,” and that amused me. They were behaving in the way they thought they were expected to behave, and it was rather phony. You can look back and smile at someone who’s dead or you can break into tears. A sense of humor is our defense against horror. DL: Is there anything that you hate doing on stage? Or would you do anything? DL: Let’s start by talking about your first project with STC. Nancy Robinette: I never thought I would act at the Shakespeare Theatre. I had done new plays at Woolly Mammoth, where I cut my teeth. And my humor, the way I approach comedy, is still more off-the-line than on-the-line. So classical work is a big struggle for me. My first Shakespeare, I believe, was Maria in Twelfth Night. I would say that I owe my Maria to Rebecca [Baila Taichmann]. She had this particular interpretation that was opposite to what I had seen. I do think I was cast against type. DL: I remember thinking that Rebecca had a very feminist interpretation of Maria. NR: I agree. Rebecca really wanted – and I think this is important in comedy – to bring out the sadness, the poles of different experience in that play. I think that any comedy is serious business. If a comedy doesn’t have some kind of redemptive or serious thing to say, it’s just not worth taking everybody’s time. It has to have that realistic or emotional universality… I teach comedy and it’s actually very tedious work. You really have to get the sense of what’s being communicated and what’s worth being communicated. There’s an essay by Henri Bergson, do you know that one? NR: Yes. He makes this point. The great classical comedies are very serious, filled with great things to say about society, as well as being entertaining. Howard Shalwitz [the Artistic Director of Woolly Mammoth theatre] used to say, “Comedy is the best way to get your point across,” because when people laugh, they’re identifying, they’re seeing something in themselves that they might not have otherwise. DL: Laughter is the glint of self-recognition. NR: I’m sure there are many reasons people laugh, but that’s the big one. DL: How would you describe your persona? NR: Oh, [sighs] I think I’ve played every ditsy dowager there is in classical literature. That’s my type, I suppose. Mrs. Malaprop, Mistress Otter, Lady Bountiful… Mistress Quickly was pretty smart. They’re all extreme characters. DL: Do you find your way into those characters by going off-center first? NR: I will, without meaning to, put a spin on the text. I’ll try to do my own thing with it before I’m ready. I’m doing that less now. I have learned here to trust the text more and to relax. To let it do my work. But I try to play the truth of the moment. It gets me into trouble. I improvise a lot. I don’t like to do the same thing in performance. I don’t want to throw the other actors, of course, I don’t mean to go that far, but I think it’s always a moving, changing thing. You just keep working on the character until you close. I’m not particularly interested in consistency or technical prowess. So I’m a bit of an odd duck. NR: The only really interesting thing onstage is how people are truly affecting each other. Most of the time, I would say 90% of the time, what you see onstage is a secondary experience of that. I do this too, of course. It gets canned and stale and you don’t have a barometer to register whether it’s true or not. The only barometer is what’s happening in the moment. So how do you get to this point where you are free enough to play with that kind of abandonment? It’s risky. I have broken up onstage a lot, and fellow actors get mad at me, and they should be upset, you know. It’s not fair to them. Joy Zinoman calls it “the tightrope”: this ability to walk on the wire and enjoy all the variables and absolutely, honestly now know how it’s going to turn out. It’s the best kind of paradox. Because of course you know how it’s going to turn out, but the quality of how it’s happening is never, ever going to be the same. DL: So how do you approach a person like Argante? She is more of a dragon lady than a ditsy dowager. You and Floyd are both playing what most people would consider the antagonists, the villains of the piece. DL: There’s that commedia influence, you’re playing an archetype. NR: Yes. The dowager, the battle-axe. Maybe I’m afraid to play a frosty figure. Maybe my muscle has been so geared toward pleasing the audience, that I don’t quite understand how much it pleases them to see the villain.